Plastic Made for Battle – part two. 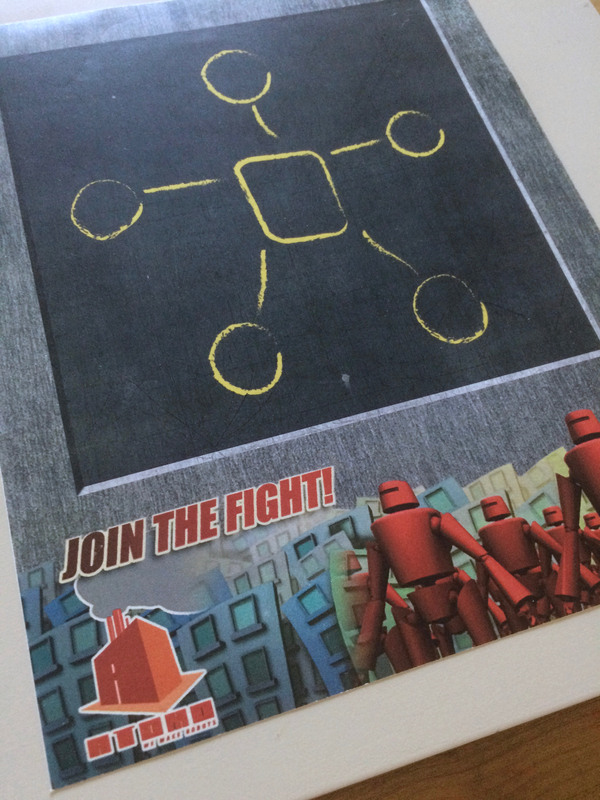 The Robot Battle League card game. I thought about the types of card games I loved to play; which ones had play systems that could fit with what Mikie and I were looking for in toy-robot combat. I wanted the game to have the speed and feel of Uno. But I was lost when it came to figuring out the initial set of rules. 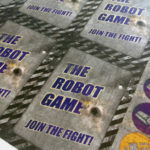 I contacted my longtime friend and collaborator, Alistair from atomicnitro.com and told him I was creating a robot game. I asked if he could design some card art. He said I was in luck; he had recently designed a set of playing cards. Alistair sent over the examples, and they were a very nice looking design; stylish and clean. His designs gave me a clearer idea of what I wanted my card game to look like, especially when fanned out in players’ hands. I wanted them to look battle worn. 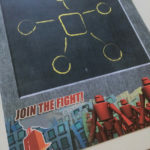 Based on the four color scheme used by Uno, red, blue, yellow and green, I asked Alistair to create a set of icons that went along with the theme of a battle-bot type competition. He returned four icons that, not only looked perfect but, once again, shaped a clearer picture on how the robot game could be played. I next went on a hunt across the outer-webs. I looked for information on different card game mechanics and eventually found several references to a game mechanic called “Take That”. This mechanic is what became the backbone to The Robot Game. Its premise involves players using cards to fight their opponents. Usually, the progress of the game was measured using a point system. Oh right, about that title, The Robot Game. That name took hold early in the process. Mikie, Alistair, Calista and I were using that title for the project during our discussions, and I hadn’t figured out anything better. So, the name stuck. I even based the logo and card-back graphics using that title. I assumed someone would eventually create something better, but I admit there was a long stretch of time when I accepted that name as official. The card types started out as four categories; attack, defense, boosts, and weapons. 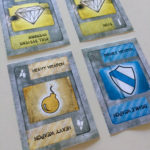 Weapon cards were difficult to incorporate into the game but provided an important breakthrough. The idea was that in addition to hand-to-hand combat, the player would have a medium to long range weapon card they would use to inflict damage. Then came the idea of being able to disable those weapons with counteractions. But how to represent this disability? If using the actual toy robots Mikie and I had built, we could just pop off the weapon attachment. Well, why not make other parts of the robot vulnerable in the same way. Arms, legs, and heads could be blasted off too, and should a particular card pertain to one of those body parts lost, the card would no longer be playable. Now we had our point system. The concept was still rough, but the game was starting to take shape. Calista printed the first deck and we were ready to playtest. Who better to test the game on than the team that inspired its creation, X-Treme Team. Challenge accepted.